Learning to Fly «Miss um... Erica?!?! Miss um… Erica?!?! When I first discovered him, I was, yes, sitting on the balcony again, and I watched a neighbor walk past and point out to his wife the little bird in the bush. They stopped a minute, checked out the bird, then went on their way. As they walked away I heard the guy say matter of factly, “It’ll probably be dead tomorrow. It’s sitting on the ground where anything can get it. It can’t even fly yet, and it’s probably hungry.” The guy was just making an observation and stating it matter-of-factly. 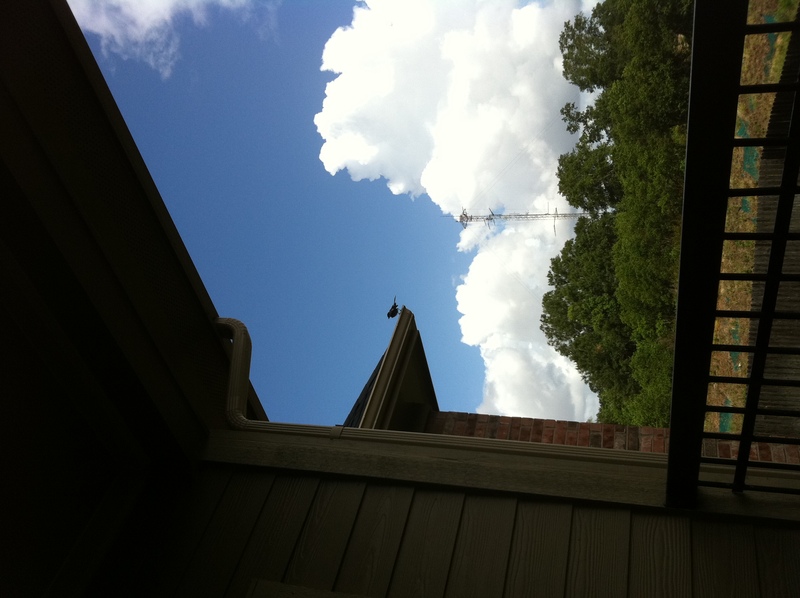 Well, I jumped up, ran downstairs (with my phone of course) and sought out the baby bird. I’m a super steady photographer, so it’s your own fault if you choose to watch the clip and get dizzy as a result, OK? Oh, yeah. You’ll also have to LEAN SIDEWAYS because I don’t know how to turn the video either. I’m WINGING it here ya’ll! You know the neighbor that spotted the bird? Well, he’s a police officer. I don’t know him, but I’m sure he’s all about law and order. (His job, not the show. I don’t know. Maybe both) ANYWAY, doesn’t God’s natural order of things show the theory behind natural selection and survival of the fittest? I was rooting for Tweety to make it, but not really thinking he would should some cat or dog come along. But his wings sprouted and he took off. Admittedly he landed in the gutter, but hey, don’t we all sometimes?Just don’t let the PETTY things drain you of your glory. Those are my ponderings for today. Check out the soundtrack there! It’s got a little sumpin sumpin for everyone. Tom Petty, Black Eyed Peas, Garth Brooks. The Hip Hop is for my bunny friends, but the musical selection is varied. Kinda like my own tastes.